WAYNE, NJ (April 4, 2014) – JVC Professional Products Company, a division of JVC Americas Corp., today announced WDBJ7, the CBS affiliate for the Roanoke-Lynchburg, Va., market (DMA #66), has purchased 16 GY-HM890 ProHD shoulder-mount camcorders, which will replace an aging fleet of Panasonic SD camcorders and upgrade the station’s ENG operations to native HD acquisition. The station has also purchased JVC’s new ProHD Broadcaster server powered by Zixi to produce live HD streaming reports from the field using the cameras paired with 4G LTE modems or hotspots. While the GY-HM890’s image quality and price point were attractive features, Novitsky is also pleased to be moving away from expensive proprietary recording media to SDHC and SDXC cards, which are significantly less expensive and available at nearby retailers. With a tapeless workflow already in place, Novitsky is not expecting a big learning curve for station personnel. WDBJ7 is also upgrading from a Grass Valley Aurora system to Grass Valley Stratus/Edius, but the GY-HM890 offers native file recording that works with either system, so no transcoding is required at ingest. 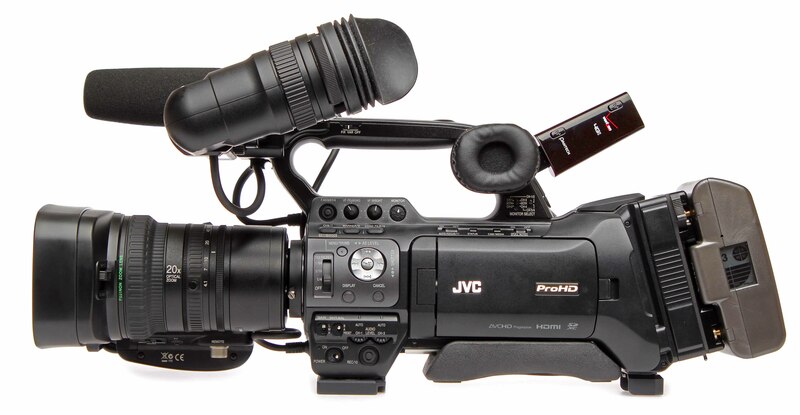 JVC’s new GY-HM890 and GY-HM850 3-CMOS cameras include interchangeable Fujinon 20x autofocus zoom lenses to deliver amazing HD (and SD) imagery, even in low light. Dual SDHC/SDXC card slots record footage in a variety of native file formats. Other features include four-channel audio with two XLR mic/line inputs, 4.3-inch LCD monitor and LCOS color viewfinder, HD-SDI and HDMI out, and genlock and time code terminals for multi-camera setups. The GY-HM890 also includes an HD/SD-SDI Pool Feed input for increased ENG flexibility, and is compatible with JVC fiber or multi-core camera modules for studio use. The new ProHD Broadcaster server powered by Zixi is the central component to JVC’s new Professional Streaming Services. It receives live HD video from the GY-HM890 (as well as the GY-HM850 and GY-HM650 3.0 camcorders), transcodes the signal for a variety of delivery platforms, manages signals for distribution through its built-in matrix switcher, and provides reliable content delivery for broadcast or the Web. 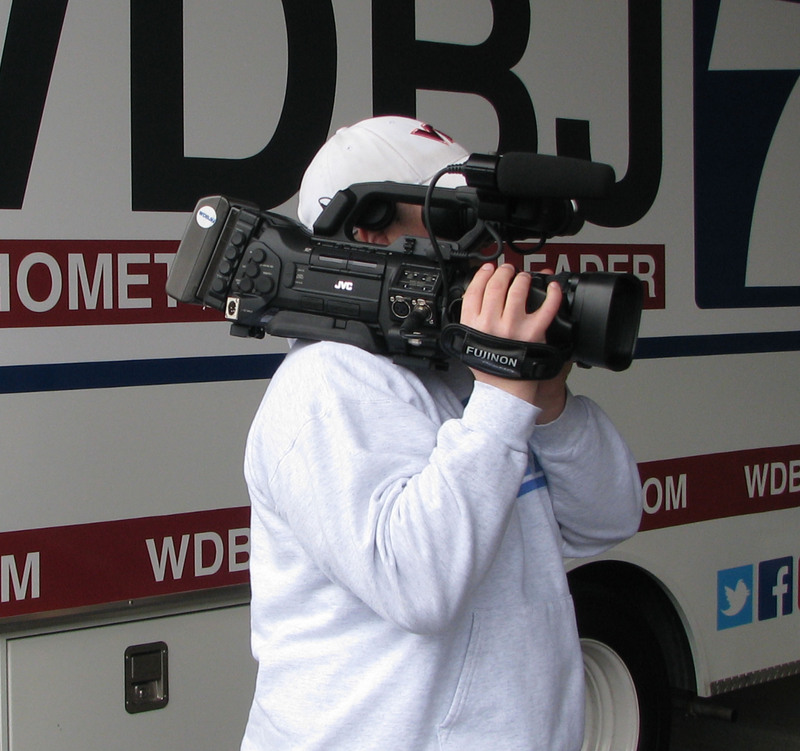 Caption: WDBJ7 photographer shows off one of the station's new GY-HM890 ProHD shoulder-mount camcorders, which will be used for ENG and live HD streaming reports from the field.